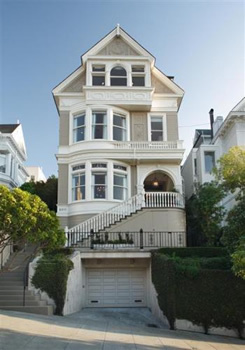 The family’s San Francisco house was featured at the start of every episode and remains very identifiable to fans of the series. The home was sold in October 1999 for $5.4 million. It was recently sold again for $6.55 million. A different interior was used for the show but the real house sports tall ceilings with chandeliers, a large kitchen, a media/family room with cathedral ceilings, two decks and an elevator that will take you from the garage to the first level. Ever wonder what was around the Salinger House? Now’s your chance to see it, from the comfort of your own home. Hints: Use the directional controls or click around the image to move around in different directions. Click on the “+” and “-” to zoom in or out and click on the upper right corner to view the area full-screen.